Bitcoin soared above $5,000 early Tuesday, hitting its best level since November. The gains ran bitcoin to a market value of more than four times that of Ethereum. Bitcoin soared more than 23% Tuesday morning to above $5,000, its best level since November. 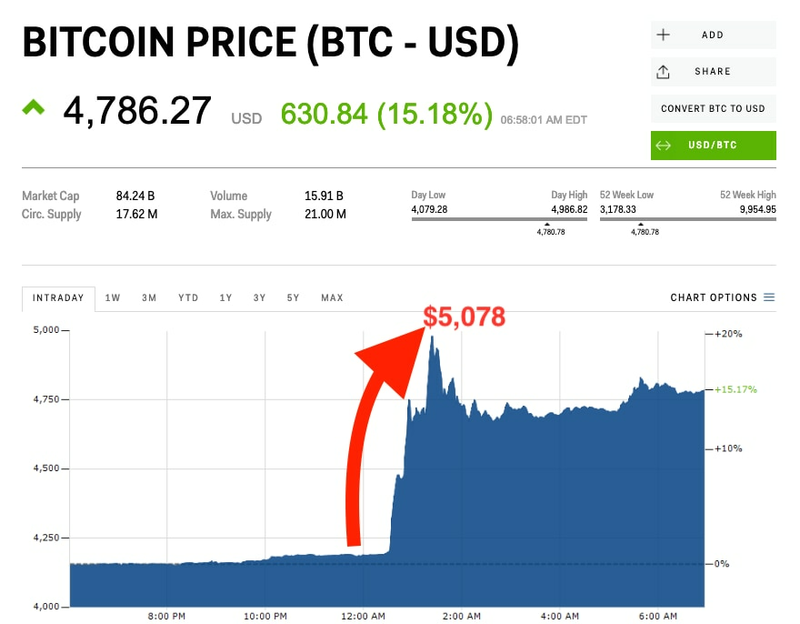 Its stay above the $5,000 mark was brief, however, and the cryptocurrency was trading up about 15% near $4,876 at 6:58 a.m. ET. The buying ran the cryptocurrency to a market cap of $85.45 billion, making it more than four times as large as its rival Ethereum, according to CoinMarketCap.com. “It looks like April Fools’ Day put the community in good mood,” said Mati Greenspan, a senior market analyst at eToro. A report from Reuters, citing Oliver von Landsberg-Sadie, chief executive of London-based firm BCB Group, suggests computer-driven trading was responsible for buying up $100 million of the cryptocurrency across exchange all over the world. And another theory floated by market participants suggested the gains were sparked by an April Fools’ Day story on the website Finance Magnates that said the US Securities and Exchange Commission was approving a bitcoin exchange-traded fund. The story was published nearly 24 hours before the advance. Before Tuesday’s surge, it had been a rather uneventful year for the cryptocurrency, with much of its price action trapped between $3,400 and $4,000. Investors in the digital currency saw its price explode in 2017 as crypto mania swept over the world. Bitcoin began 2017 worth less than $1,000 a coin before soaring by more than 2,000% to a high of $19,511. The next year was a different story, however with the cryptocurrency’s value plunging by 70% in 2018, bottoming out at $3,136 in December. Bitcoin was up 12% this year before Tuesday’s gain.